Customers today have many options when searching for carpet stores in Bel Air, MD, which is why you should choose a store that locals trust with their business. Our franchise is known nationwide as the place to go for stylish, quality flooring that is made to stand up over time. Stop by today and take a look at our selection of fine carpet. For many home and business owners, carpet flooring is the ideal flooring choice. Not only are carpet prices low compared to other flooring types, but there are also a number of advantages that come with this type of flooring. Whether you have a house with a ton of foot traffic or an office with hundreds of employees, you are probably tired of hearing them all walk around. There is no denying that hard-surface flooring looks great, but it leaves something to be desired for noisy environments. Offices in particular do well with carpet because it dampens the footsteps, voices, and even the typing sounds of employees. With cubicles and shared workspaces becoming the norm in corporate America, it is vital to have noise levels under control. 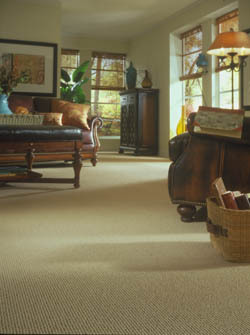 Do you already have hard-surface floors, but prefer the comfort of carpet under your feet? Enjoy both when you purchase area rugs for your spaces. We carry a number of beautiful rugs in different sizes and styles. They make it easy to totally transform any room, making it feel more welcoming. Carpet, perhaps more than any other type of flooring, demands professional installation. Carpet installation involves precise cutting of the material and fitting so that it isn’t lumpy, or crooked, but still comes into contact with the walls. If cut too small, there will be gaps. When cut too big, there will be lumps that could cause someone to trip. Our installation experts have the skills and experience to do the job right the first time, perfectly. Contact us to learn more about what types of carpet we have available. We serve residents of Bel Air, Fallston, Forest Hill, Abingdon, and Kingsville, Maryland, as well as the surrounding communities.